You are here: Home / News / Father’s Day comes with amazing gifts! Father’s Day is just around the corner and we’ve come up with amazing gifts for all you expats out there wanting to catch up with your great dads! Ok, so being miles away from your father gets you a bit nostalgic. Your best friend, your dad. Always there, never giving up on you. Holding that bicycle for you to learn how to ride, teaching you how to play chess, showing you how a car engine works, even though you’re only ten and being your biggest fan at every baseball game, back in high school. And let’s not forget, always telling you his old jokes, ’cause he knows they’ll cheer you up anytime. Maybe you won’t be able to be with him in person this year, but give him a call. You know it will make your dad happy just as well. Fill in the blanks, share your love for your awesome dad and win one of the 3 prizes. 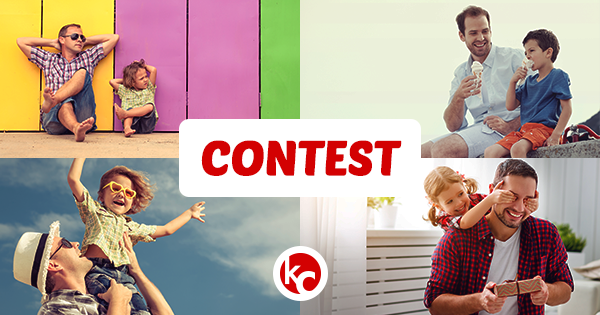 Let everybody know how amazing your dad is on the KeepCalling Facebook Page by June 18 and your comment automatically enters the contest for free international calls home. The 3 winners will be picked randomly and get $10 Voice Credit for international calls. No idea what to get this year for Father’s day? We’ve made plans for this special day and have good news for you: Tello’s giving away a 100% Free Phone Plan including 2 GB and unlimited talk & text between 14-20 June for every newcomer. The offer is available for newcomers only and works easily with a coupon code. Keep in mind this is a limited offer only, and the plan is free for the first month of service. Buy the $19/mo cell phone plan with unlimited mins, text + 2GB. Join Tello with this great offer until June 20 and enjoy the first month of service for free. Don’t miss the special Father’s Promotion and all the other fun surprises we have in store in the future. 6 inspiring facts about KeepCalling at its 16th birthday KeepCalling celebrates Immigrant Heritage Month!